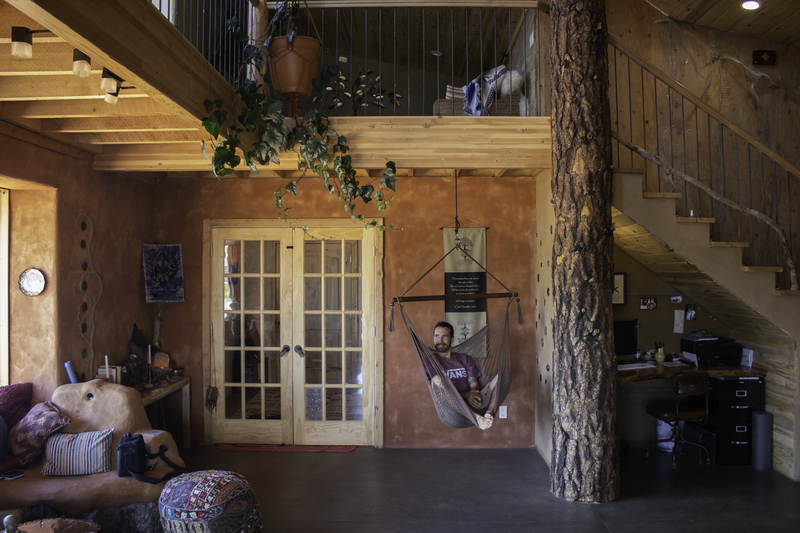 ST. GEORGE — Standing in pits of mud, hauling straw bales and enduring the heat of a Southern Utah summer while barefoot were all part of one couple’s experience when building a straw bale house. For Nick and Kim Phillips, building the house was nothing short of an adventure. 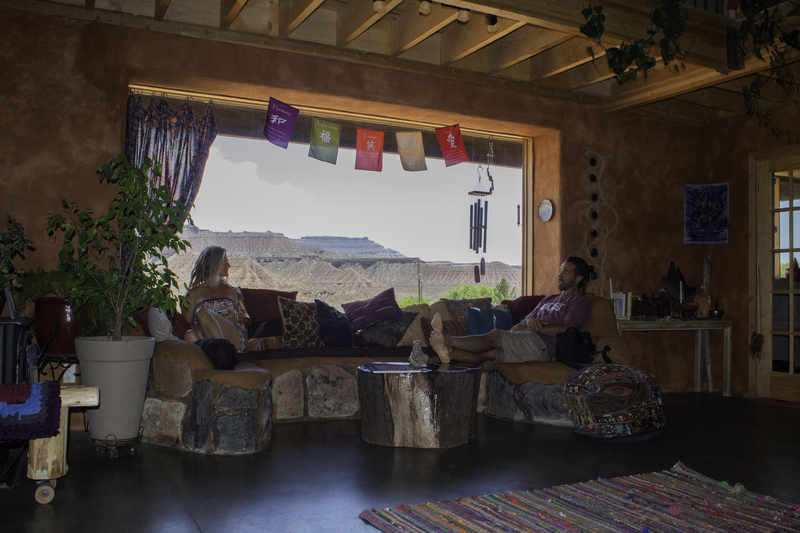 What started as inspiration from Earthship houses became a reality when the two bought an acre of land in Virgin and began construction of their very own earth home. Earth homes come in many different forms. After extensive research they decided to build their house with straw bales for better insulation and inexpensive materials. The house, with its 1,300-square-foot interior and 700-square-foot garage, cost $160,000 to build. Starting in February 2017, they designed the house themselves, including the floor plan, plumbing and electric, making it truly their own. They built most of it themselves, hiring help for installing plumbing and electric and hiring their builder friends Josh Kitchen and Drew Allred, without whom they could not have accomplished what they did, Kim Phillips said. Because they didn’t hire a contractor for the project they were able to make last-minute changes and additions to the house as they went, such as adding a loft to the plans after a makeshift one was put up for the construction. The couple had help from builders and friends who were interested in learning the art of constructing earth homes. They welcomed the help of family and volunteers, including Nick Phillips’ father and stepmother Ron and Cathy Phillips, who came to help almost every day, and Kim Phillips’ 16-year-old son Trey Mower. 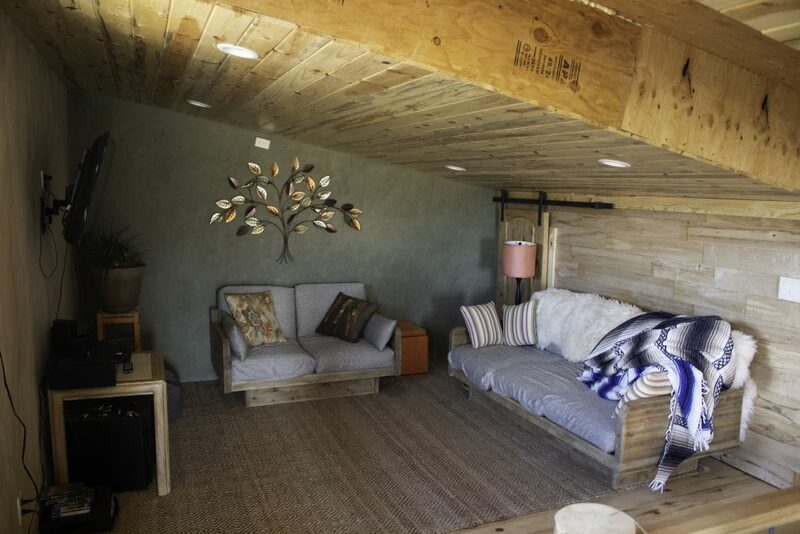 Much of the building process was documented by Kim Phillips in the couple’s blog, Earth Home Journey. 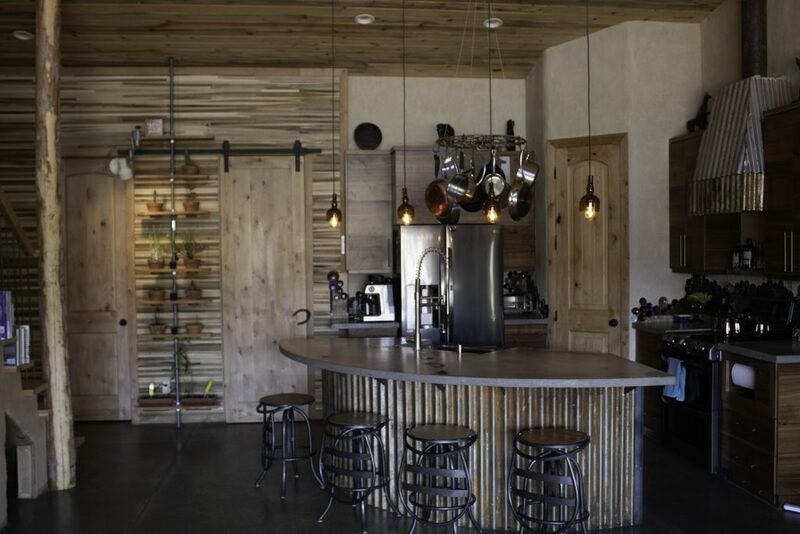 They put up a post-and-beam double frame, and fit the 18-inch straw bales between the beams. They staggered the bales like bricks, cut notches in them when necessary to make them fit as tightly as possible and filled in any gaps with a mixture of straw and mud. While they had to order the straw bales, they used local sand and mud for the building and gathered rocks from public land. To compress the bales to prevent them from settling over time, they stabbed the bales through threaded rods that were bolted to the concrete beneath. Then they made a ladder out of beams, laid it over the bales and pressed the bales down using a leverage system. For the walls of the house they used a mud plaster to allow the straw to breathe to prevent mold and moisture from collecting. For the inside walls Kim Phillips tinted the plaster in lieu of paint. They built the house so that the north side is half in the ground to help keep it naturally cool. The house was built to be largely sustainable, especially when it comes to heating and cooling. The house is equipped with a wall-unit air conditioner and a heater, but they rarely need to use them. For heating, they use passive solar, a large window facing south allows the lower winter sun to come in and heat up the concrete floor. They also have a wood stove that they use at night and early in the morning, but the window is the main source of heat. They have very few windows besides the main one, and the overhang of the roof keeps the sun from shining in the window as much during the summer to help keep it cool. They also have underground cooling tubes that run the hot air from outside underneath the house, cooling it to around 55 degrees before it blows into the house. The straw bales also provide better insulation than a traditional house. The earth home has an insulation value of R-50 while the recommended wall-cavity insulation value for a wood-framed house in Utah is R-25 to R-30, according to Energy Star. Without using fans or air conditioning, the house stays around 85 degrees in the summer. The house is not yet fully sustainable. They plan to add solar panels and start collecting rainwater for gardening in the future. For now, they are hooked up to city power and use city water. They got occupancy on Dec. 7, 2017, but the house is still not complete. 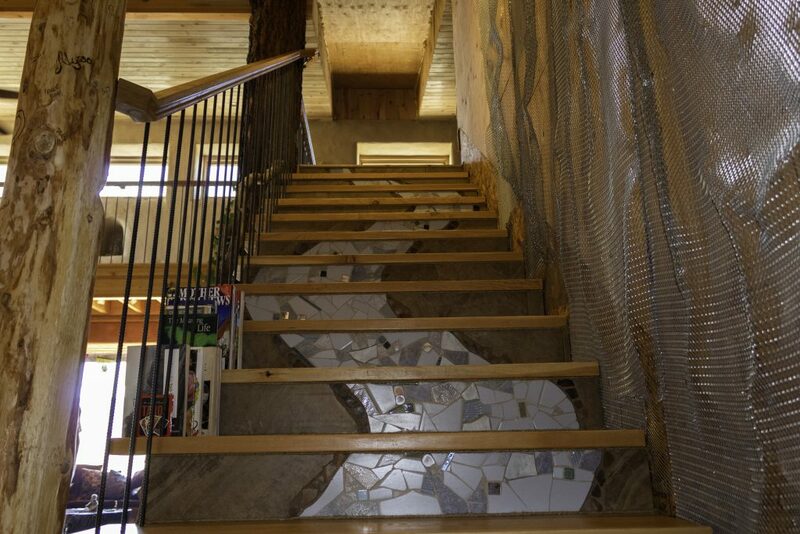 Extra projects like finishing the back porch and constructing a rock wall in the stairwell are on their to-do list. The building process was a collaborative effort. Building an earth home was a new experience for everyone involved. “It’s amazing what creative minds can do when they get together and make sense out of nonsense. And that’s usually what it feels like when there’s no experience to integrate into it and you start from scratch,” Ron Phillips said. Aside from the actual building, most of the materials for the house were donated, recycled or bought secondhand, even most of the windows and furniture. The interior of the house was designed to be unique and artistic. A window seat made from rocks clay looks out the large window. 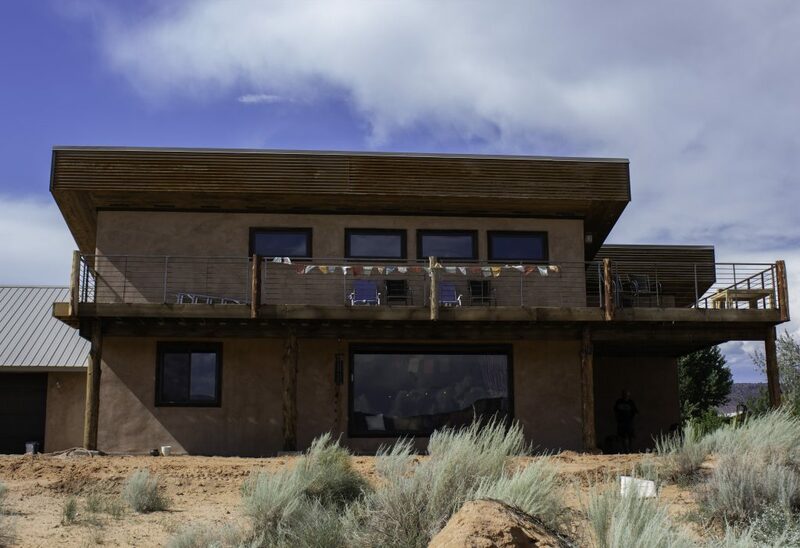 A loft above the main room provides a cozy place to relax or watch television, and a large porch upstairs looks over a stunning desert landscape. 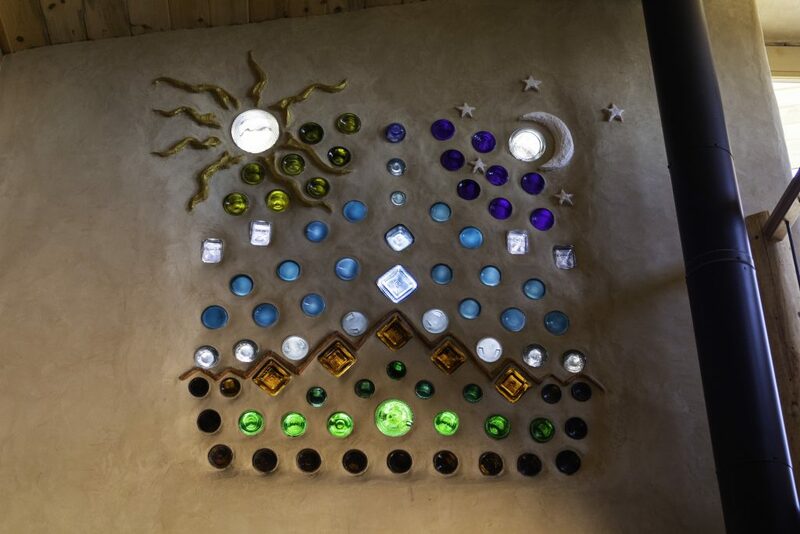 Glass bottles are arranged in a colorful design in the wall, brightened by the sun shining through. 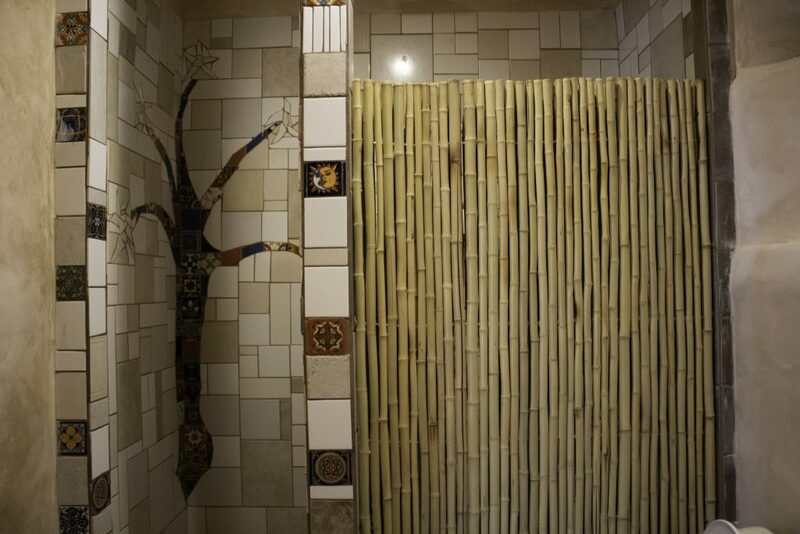 Tree trunks stand tall for support and aesthetics, and tiles create artistic designs in the bathroom and up the stairs. “This was Kim’s canvass. She was an artist every day of the build,” Nick Phillips said. 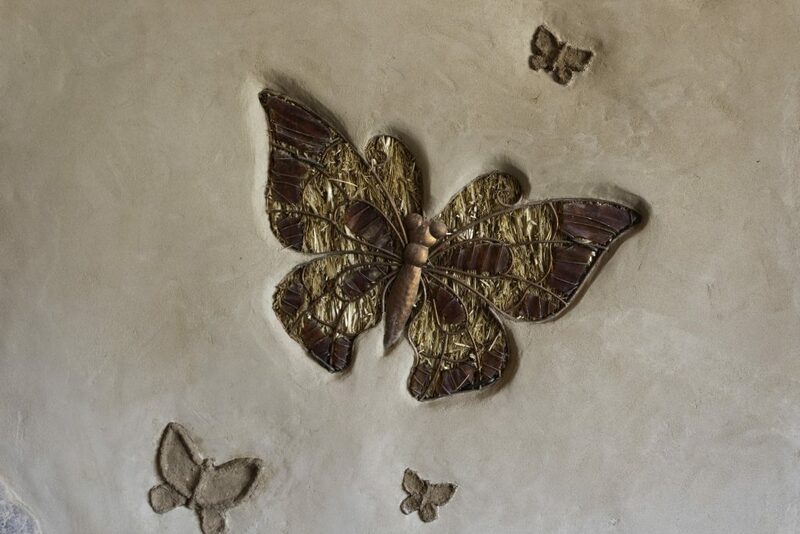 Because of the mud plaster, the home is quiet when you walk in, peaceful, said Cathy Phillips. One reason Kim Phillips wore no shoes throughout the building process was to experience “grounding” or “earthing,” the process of making direct contact with the earth to relieve the body’s energy charge, which some believe helps people feel better and heal faster. The mud plaster walls and naturally sealed concrete floor in the house were designed to allow a grounding effect even indoors. The couple took their time and were flexible with their plans because they wanted the house to be a reflection of themselves. They did not want to settle or have regrets. “I wish people could take advantage of that opportunity more when people are building their own home. To take advantage of that process to be able to make it what they want,” Kim Phillips said. 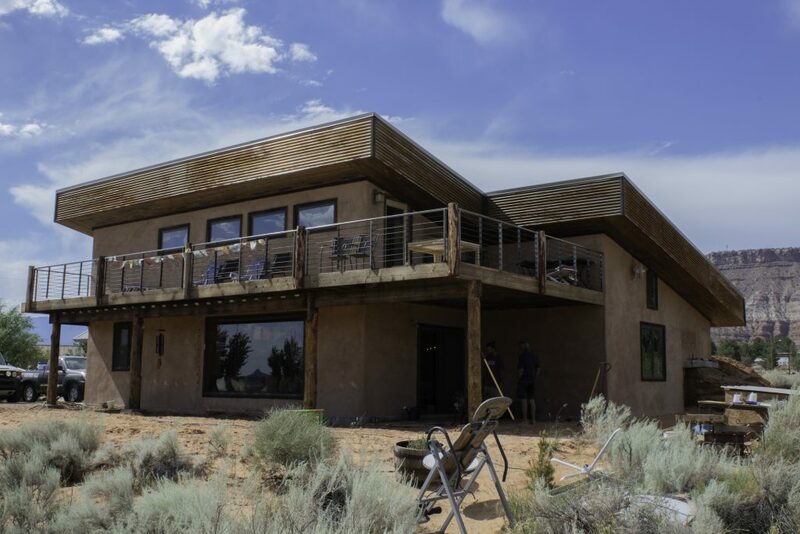 Not only was building the earth home efficient, it was a meaningful experience for everyone involved. During the build they watched people who helped undergo emotional healing. Because the experience was so special, they wanted to give the house a name, Aashiyana, meaning “beautiful home” in Hindi. “As we built the house, the house built us. It was a creative journey,” Ron Phillips said. Straw and cob is a very mature, tested building method. There is nothing speculative or risky about it. It’s very efficient in every way except man-hours, but for someone that has the time to do it, why not? Congrats on a beautiful home! I love the touches like the tree inside and embedded glass. I see the chimney but not the fireplace. The cob bench seat would have been a great place for a rocket mass heater (maybe that is what is there and the pictures just don’t show it). The creativity and unique beauty of this home is very impressive. The bottle wall decor is lovely, as is the view. Years ago I had someone construct a 7′ stucco wall around my property. Instead of being cinderblock covered with stucco or plaster, it was foam sheets held together and to a foundation with metal strapping, then covered with chickenwire before the scratch coat and stucco finish were applied. It was very lightweight, very strong and beautiful. It would not break apart or fall in an earthquake and a car would not have been able to drive through it. Although it was just a wall to enclose my property, I’m sure it would have been very efficient at insulating as well. The foam was as thick as cinderblock. I’m surprised more homes aren’t constructed this way. Nice job Kim and Nick! We’ve read about other homes using the foam(blocks etc) and Yes-it seems to be very efficient. I hope others catch on to this alternative way to build. Thank you so much for your response. I’ve been watching your progress and this is so cool to see the inside. I will pay you and your friends $200,000 to duplicate that house. I wouldn’t change a thing. Thank you so much for the kind comment. I’ll definitely pass the word onto my builder/friends & see if we’ll take you up on it haha. It was hard work but so worth it. That’s nice. 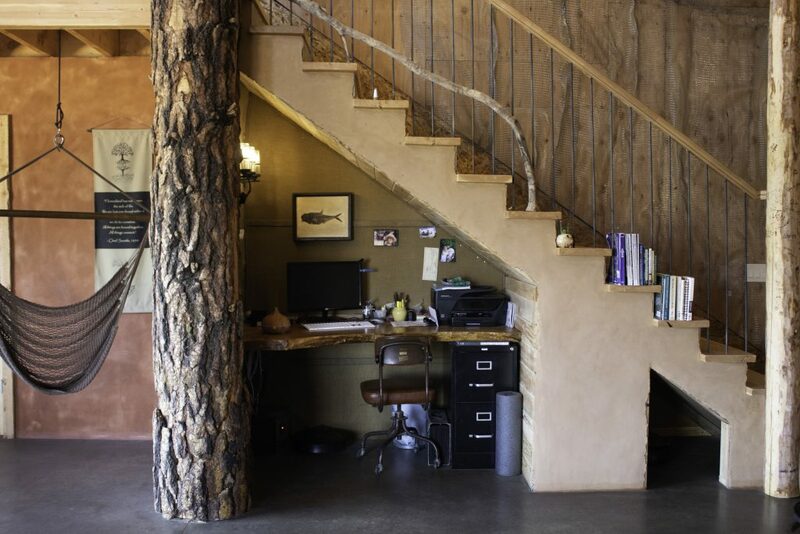 I’m not into a tree trunk in the house, but they are and they did a great job. Looks cozy! Wow, incredible work, and a beautiful home for some well deserved hard workers! Enjoy it, I’m sure it will out last all of us, this is a very old and solid building technique for a reason. 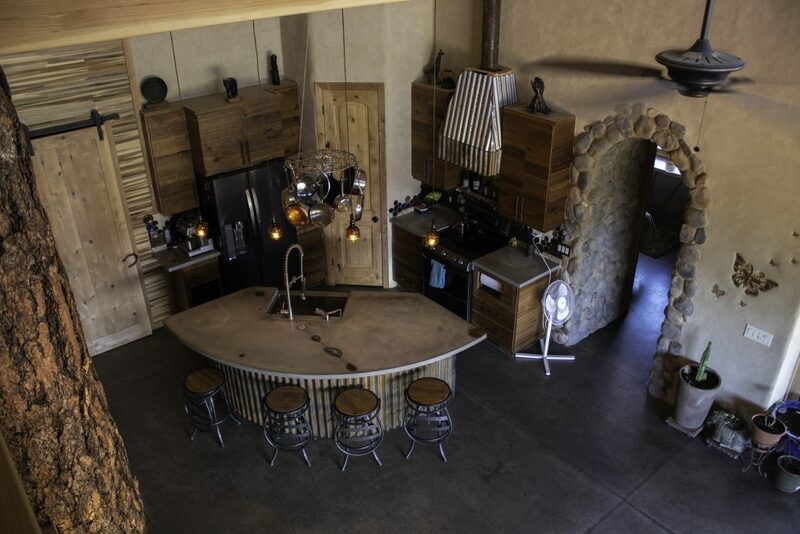 Love the artistic touches, the natural elements built into the home and the way the whole thing turned out. Your hard work certainly paid off a well deserved Congrats! Seriously, the house is a work of art. I’m guessing you’re into permaculture. You probably already know, but if not, check out Rawutah on youtube. He’s up in Hurricane and has a cool permie style small lot he’s growing a lot of food on. Ali’s Organics is in Laverkin, and she has a lot of good videos on how to garden locally with a nice small shop out of her home.